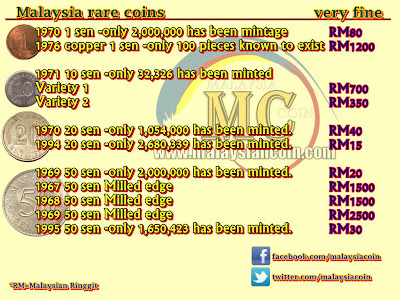 Today I share with you Malaysia rare coin price and value Infographics. I am not very good at Infographics but will try to improve them next time when I have learned to make Infographics. The value that I share in here are in Malaysia Ringgit (RM). You can share the Infographic with everyone as long as you don't alter anything on the picture. I also appreciate it if you can give a linkback to my blog. Just for information, the word "rare" in here means coins that Malaysian collectors are looking for not "rare" in numismatics. 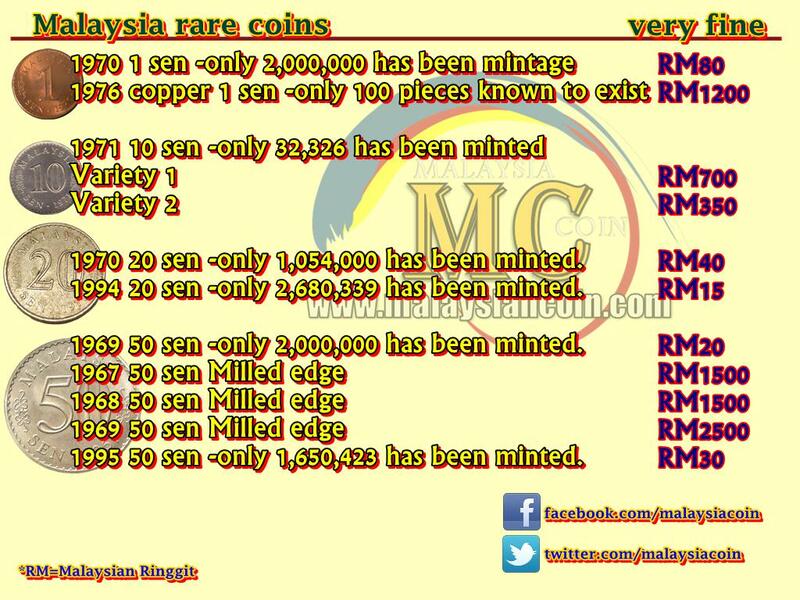 You can read updated story about Malaysia rare coins in this post; Malaysia rare coins. -Malaysia 1971 10 sen -only 32,326 has been minted (this coin have 2 variety). -Malaysia 1970 20 sen -only 1,054,000 has been minted. -Malaysia 1994 20 sen -only 2,680,339 has been minted. -Malaysia 1969 50 sen -only 2,000,000 has been minted. -Malaysia 1967, 1968 & 1969 50 sen without security edge. -Malaysia 1995 50 sen -only 1,650,423 has been minted. For their price and value, you can read about it in my blog; www.malaysiancoin.com. 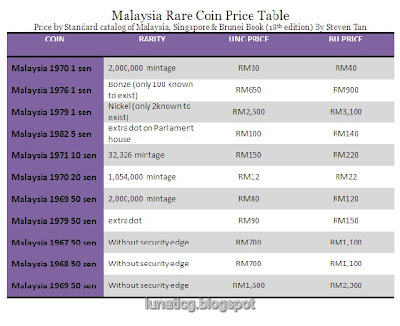 For anyone who are looking for the old Malaysia Rare Coin Table Price, I still show them in this post. For your information, this is an old Malaysia coin price. I wrote it in February 2009. The price is according to Malaysia, Brunei and Singapore Standard Catalog (18th edition) by Steven Tan.